Get delicious recipes and cooking tips! Chef Chris Koetke shows you how to make two very different burger styles -- Mediterranean and pizza. And, Tom and Eddie share a recipe for a delicious edamame veggie burger. Plus, learn how to prepare a classic side to go with your all-American dish, and we're not talking about fries! Chris Koetke makes a very different burger style -- Mediterranean. 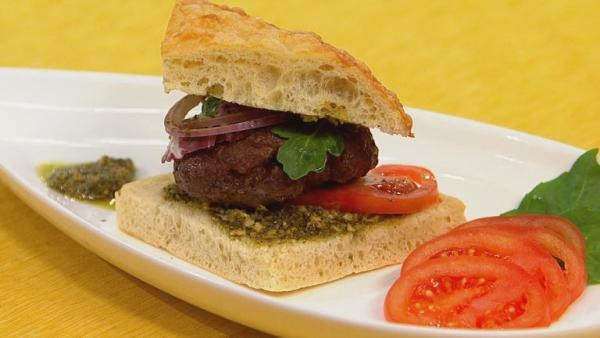 Chef Chris Koetke takes a Mediterranean burger and turns it into a pizza burger. Tom and Eddie join the show for a delish edamame veggie burger. This is Chef Chris Koetek take on an American classic -- three bean salad. Beans come in so many interesting flavors, colors, and textures -- five different beans make such a more interesting salad.